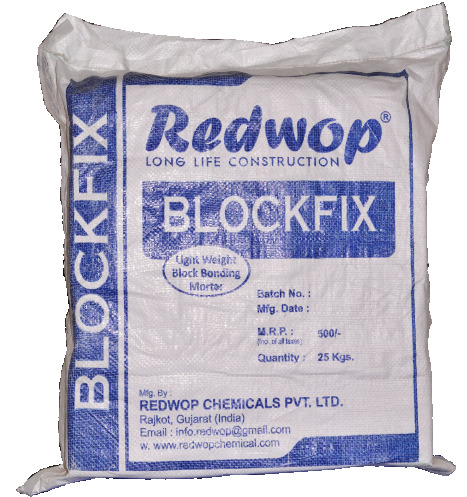 Blockfix is a versatile thin jointing material for joining AAC blocks, fly ash bricks, concrete blocks etc.This mortar is specially designed to provide stronger, much more durable bonding between the blocks with superior adhesive strength. It replaces conventional cement and sand mix mortar. FEATURES • Blockfix is made from a unique combination of cement, graded sand and proprietary additives. • The unique chemical combination enables this mortar to be more compact, thinner and stronger. • At only 3 mm thick, it is far thinner than the conventional mortar which is between 12-18 mm. • Being pre-mixed it is easy to use and also ensures the compaction of interlocking bricks making the bonds tougher and more durable.